Safeties need to be versatile in today’s NFL. The best at the position can thrive from any pre-snap alignment, play the run and make plays both in coverage and rushing the passer. As such, all of PFF’s advanced stats and pre-snap charting tied to defensive players apply to today’s safeties. All of PFF’s coverage metrics (i.e., yards allowed per coverage snap, passer rating allowed) that apply to cornerbacks and linebackers also apply to safeties, as does pass-rush productivity. Tackling efficiency and run-stop percentage also come into play, especially for box safeties. Tracking where safeties line up pre-snap is also vital to understanding the impact and value any given safety brings to the table. For example, New York Jets’ Jamal Adams played 489 defensive snaps in the box, 281 at free safety, 172 at slot cornerback, 137 along the defensive line and another 40 at boundary cornerback. Outside of Premium Stats 2.0, PFF charts depth of target for cornerbacks and safeties, which can shed light on how defensive backs perform when targeted at the short, intermediate and deep levels of the field. 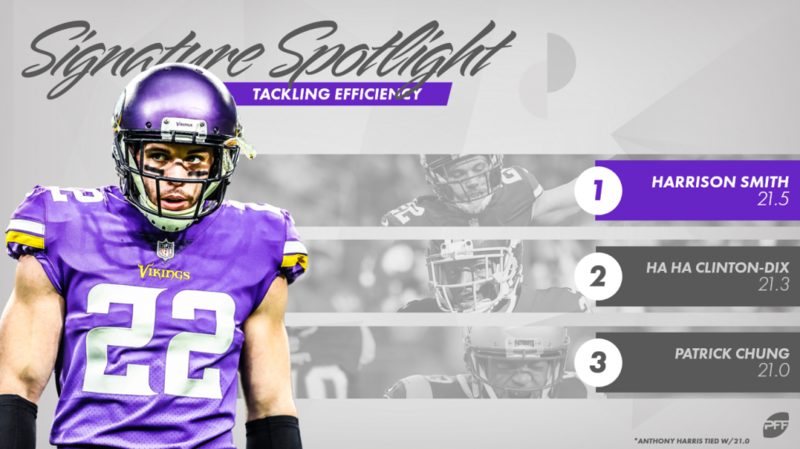 The NFL’s most efficient tackler at the safety position in 2018 was none other than Minnesota Vikings’ Harrison Smith, missing just four of his 86 tackle attempts en route to a position-high 21.5 tackling efficiency. He missed just one tackle on his 406 run-defense snaps and three on his 571 snaps against the pass. New York Giants’ Curtis Riley, on the other hand, would likely hope to forget his tackling performance in 2018. The fourth-year Fresno State product missed a position-high 23 tackles across his 988 defensive snaps this past season, giving him the lowest tackling efficiency (3.9) among the 74 NFL safeties with at least 400 defensive snaps played. Riley, however, made up for at least some of his tackling woes with his play in coverage. He didn’t allow a touchdown in coverage all season long and logged four interceptions this past season, fueling his second-ranked passer rating allowed (39.5) among safeties. Though he played just 602 defensive snaps and attempted 42 tackles, Vikings safety Anthony Harris finished tied for third in tackling efficiency (21.0) among qualifying safeties in 2018. But, perhaps more impressive is Harris’ passer rating allowed in coverage, as he led all safeties with 250-plus coverage snaps played in passer rating allowed at 24.0. He allowed just 13 receptions for 52 yards and logged three interceptions from 13 targets across 324 coverage snaps. Both Riley and Harris allowed low passer ratings in coverage from a low target volume, which, though impressive, pales in comparison to Eddie Jackson’s efforts in 2018. The Chicago Bears’ phenom ranked third in passer rating allowed (54.9) while seeing 44 targets in coverage, more than doubling Harris’ target count and finishing 21 ahead of Riley. Jackson allowed receptions on 24-of-44 targets for 256 yards, three touchdowns and six interceptions on the year. Jackson’s ability to read the eyes of the quarterback and attack the ball in zone coverage led to a litany of turnovers and defensive touchdowns for the former Alabama superstar in 2018. Here, Jackson jumps in front of Ryan Fitzpatrick’s pass intended for Mike Evans after reading his eyes like a picture book from snap to interception. New Orleans Saints safety Vonn Bell’s name doesn’t come up often for his efforts in coverage, but his run defense is among the league’s best at the position. He led all 61 NFL safeties with 200-plus run-defense snaps played in 2018 in run-stop percentage at 8.8%. The safety ranked after him at second, Giants’ Landon Collins, finished the year with a 7.2 run-stop percentage. Here, Bell takes an off-ball linebacker alignment pre-snap on 4th & 1 to help stuff the run, and he does exactly that. He flows to the open hole and fills it with purpose, stuffing the ball carrier for no gain and getting the ball back to his offense. Only 19 safeties rushed the passer at least 25 times in 2018, but Arizona Cardinals veteran safety Antoine Bethea took the cake among the slew in terms of pass-rush productivity with his position-high 17.9 mark. He recorded 12 total pressures (six hurries, three hits, three sacks) across his 42 pass-rush snaps this past season. Los Angeles Chargers rookie Derwin James finished right behind Bethea in pass-rush productivity (17.7) and tied for first with Jets’ Adams in total pressures on the year with 18. James and Adams, because of their positional versatility and high-end play in multiple areas, represent the next generation of safeties in the NFL.